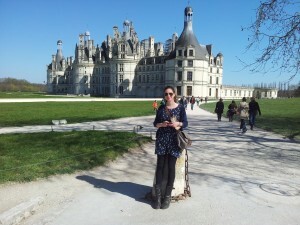 Chambord, Clos Luce and the Saumur Mushroom Museum – Some Typical Touristy Stuff – 2-4/4/12 | Camperissimo! It’s hard not to compare this trip to our other trips every time I write a blog entry. With our previous trips not many people knew a lot about the countries we were travelling through (and writing about) and we were often amazed by the unusual things we ran into. It was easy to write about things that were so foreign and surprising. France, on the other hand, I find more difficult to write about. It’s a country that everyone knows something about (baguette, croissant, château, fromage, “Bonjour mon petit bureau de change” … a Flight of the Conchords reference there), even if only because we were forced to do so in history class at school. It’s difficult and discouraging to try being creative and original when writing about a country that has been an inspiration to countless writers, artists and tourists for centuries, so I’m not even going to try to (for now :-)). Instead, here’s a few interesting and extremely touristy attractions we’ve visited in the last few days. You can’t drive down the Loire Valley without seeing a château, big or small, in literally every town and village you drive through. Of course, it’s also impossible to visit them all. Well, probably not impossible if that’s your life’s mission and dream, but you would really have to be very determined, have loads of free time and be extremely interested in chateaus. Which we aren’t. We saw the chateaus in Sully, Ambroise and Saumur but didn’t actually go in. Instead, we decided to limit the number of chateaus we actually visited to just one. And Chambord, being the biggest and most kitsch of them all, was our choice. It was built as a “hunting lodge” for King François I but it seems like his idea of a hunting lodge was a bit different from mine. It’s absolutely huge and weird and fantastic from the outside. The views of his hunting grounds from the uppermost terraces are spectacular. Inside it was draughty and cold and I got bored of it pretty quickly, since there are 440 rooms you can visit (and I only have patience for small museums). The town of Amboise is small but charming (which is pretty much typical for a town in the Loire valley, to be honest.) 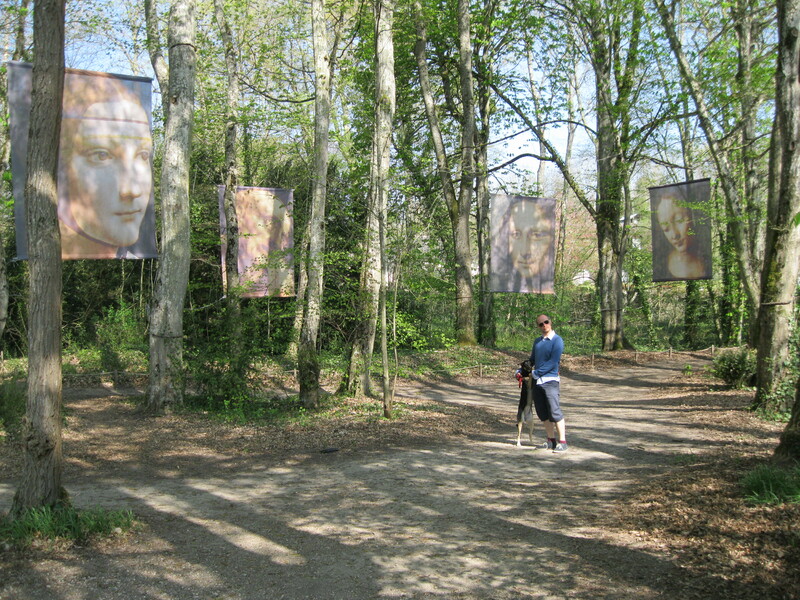 The place we found the most interesting in it was Clos Lucé, a mansion in which king François I grew up and Leonardo da Vinci spent the last three years of his life. Knowing that it was a home of king François, I had expected something similar to his lodge in Chambord. I was pleasantly surprised when we climbed little streets of Amboise to a relatively small mansion surrounded by a beautiful park and garden. (I guess François must have really suffered as a child, being forced to live in a house with less than 100 rooms). Thanks for the bridge, Leonardo! The museum is really well organised and quite original. The tour starts in the mansion, where you walk through the different rooms with the original furniture (most of it from the 18th century though) on the first floor and the ground floor is a museum dedicated to Leonardo’s inventions. There are sketches, models, 3-D computer animations and well-written explanations of 40 of his original (more or less) ideas. Those same inventions you can then visit in the park where they have been built in real-life size. The museum has little to do with the time that Leonardo da Vinci spent living in the mansion, but it was still very interesting. 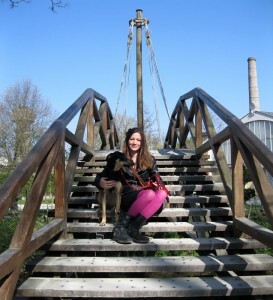 Another thing I liked: dogs were allowed in the museum park. They were also allowed in the mansion itself, but only if you carry them. 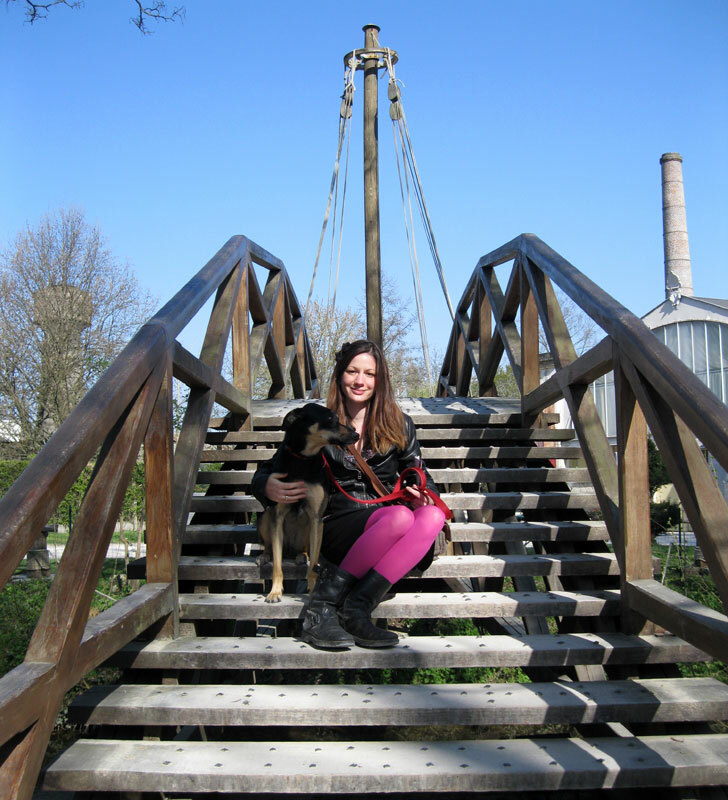 We weren’t sure Klara would have liked being carried around for an hour, so her tour was limited just to the garden. The thing I didn’t like: irritating renaissance music playing on repeat inside the mansion. 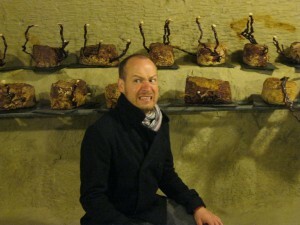 The third touristy thing we visited was the mushroom museum in Saumur. To be honest, I am not sure if it is actually popular with tourists since we were literally the only visitors on a gloomy Wednesday morning in early April, but if it isn’t, it should be, because it’s fascinating and disgusting at the same time. Well, maybe other people wouldn’t find it disgusting, but I did. Also, maybe other people wouldn’t find it fascinating, but Jay did. The museum consisted of a moist, cold cave with long hallways in which mushrooms are grown. Lots of them, different sizes, shapes and colours. Some of the kinds I’d already heard of, some of them were new to me, some of them are new to the world as a whole, because they are experimental hybrids created in the cave. All of the descriptions were written in English as well which made the whole tour a lot more interesting. We found out, for example, that there is a mushroom so poisonous and powerful that only one could kill an entire family. On hearing that we spent a few moments imagining that sad, poor family, all of them nibbling on one mushroom … I got so carried away imagining that I forgot the name of the mushroom. And what it looks like. So this blog post is not very helpful for those of you who hope to avoid lethal mushroom poisoning. Most of the mushrooms. I found them slightly disgusting, when growing in a group of a thousand. I wrote “things” in plural because there were many mushrooms I didn’t like. 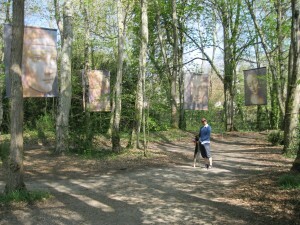 This entry was posted in Camper Trip April 2012 and tagged Chambord, Leonardo da Vinci, mushrooms. Bookmark the permalink.